I started by researching online for training programs designed to improve my 2000m rowing time. The first articles I found pointed me towards either The Wolverine Plan or The Pete Plan. Both seemed like quite intense training programs and I was hoping for a less time-consuming alternative. After creating This Spreadsheet to collate a few other programs, I settled on a Custom Plan from a recommended website. 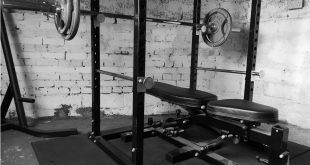 Simplicity – Once you know the training zone for each workout you simply row it at that pace. Volume – I selected four sessions per week which seemed more manageable than the 6 sessions in the more popular Pete Plan. Taper – The intention was to peak on a specific day, and the built-in taper meant it eased down the intensity in the final week so that I was fresh for race day. 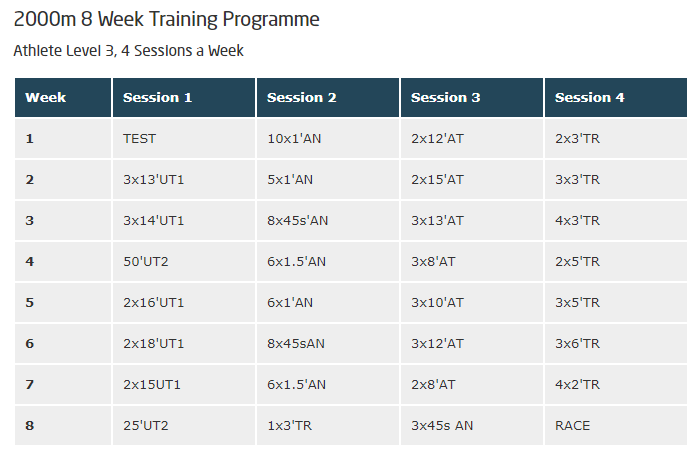 I selected an 8 week block of training, with the four days chosen by me as Monday, Wednesday, Thursday and Sunday. I pulled some gym exercises from here and made a little gym routine to fit on Wednesdays, Fridays and Sundays. This included things like Power Cleans, Front Squats, RDL, Push ups, Batwing Rows, Pull ups and Inverted Rows, aimed at making me more resilient to injury and a little stronger in the muscles used for the rowing stroke. Each workout you’re presented with a range which your pace should be between, determined by your time in the initial 2000m time trial on day one. For me that was 7:55.2 and for example that meant the Wednesday session of 10 x 1 minute row, 1 minute rest was to be completed between a pace of 1:53 and 1:57 per 500m (prominent on the rowing machine display). What surprised me most was the lack of intensity in each session. It was my choice to not aim for the lowest possible split in each workout, but I still kept to the faster end of the range. A good friend of mine is an endurance athlete and I’m aware a lot of the training is at a low intensity, something I’m not used to coming from a sprinting background, and so I trusted the process. For the longer sessions my focus was on stroke rate, and where a range of 22-26 SPM was recommended I would complete each piece (rowing lingo for rep) at a consistent and varied pace. That meant if I had 3 x 13 minutes they would be 13 mins at 22 SPM, 13 mins at 24 SPM and 13 mins at 26 SPM. It wasn’t long before I started using music to distract me from the monotony, and I even experimented with selecting music whose tempo matched my stroke rate. 22 SPM would fit 88 BPM music, but I found as soon as I was off the beat it was more of a hindrance to get back on it, so I returned to music for entertainments sake. 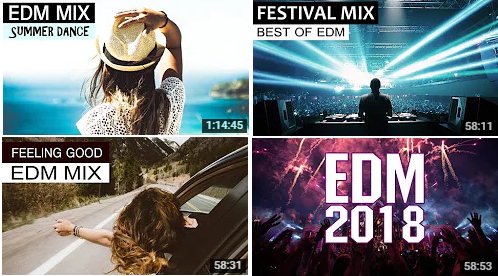 I recommend something upbeat, such as EDM (Electronic Dance Music) of which there are hundreds of hour long mixes available on YouTube. In terms of technique I already knew some of the basics and I didn’t do much tweaking. I did try to pull the handle slightly higher up my chest and avoid bending my arms too soon into the stroke. What struck me was how much the biceps are used in a rowing stroke, as they were the first thing to fatigue and often had soreness the following day. 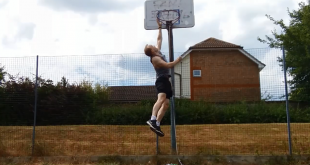 This could be a flaw in my technique but the soreness continued with me throughout the 8 weeks and I think I managed to build some muscle from it. The taper began in the middle of week 7, with 10 days to go. This was a welcome relief and I used the opportunity to ease off and eventually stop all gym training. One thing I did was to replace that with flexibility and mobility work, as despite strict post-workout stretching I found myself getting tightness in my legs and back. I’m confident this shaved a few seconds off my final time by allowing my muscles to operate fluidly during each stroke. The program it generated for me, based on 4 sessions/week for 8 weeks. 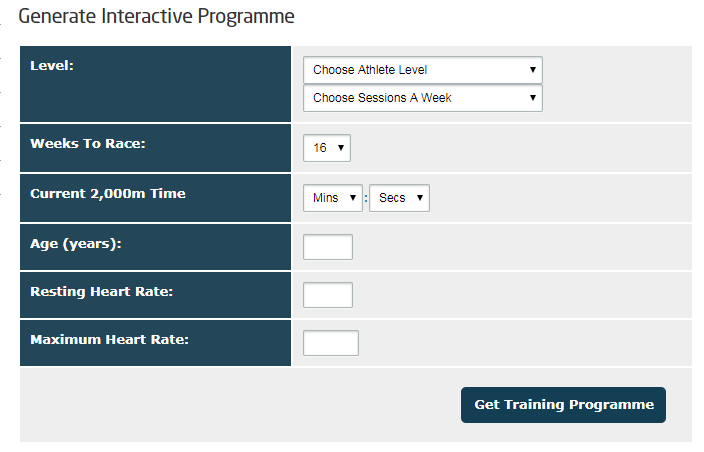 Each session has a Training Zone referenced from the table earlier. I started off with a thorough 15-20 minute warm-up, mostly off the rower doing active stretches such as leg swings and squats. In terms of strategy all I knew was to pull four hard strokes and immediately settle into my rhythm. I could have a desired pace in mind but it’s important to feel natural in the rhythm you hold and for me that was luckily slightly faster than I anticipated. In my head I broke it down into 4 x 500m, with the first three set aside for holding a given pace and in the fourth increasing my stroke rate to compensate for what would be a reduced power output per stroke due to fatigue. It didn’t go exactly to plan as I was falling off the pace with 1k to go, and the final 500m was more about holding on than any sort of “sprint finish”. I was very chuffed to stop the clock at 7:29.2, a full 26 seconds faster than I’d managed on my first day. On day 1 I think I could have pushed more whereas after this I knew I gave my all and paid for it with a full 10 minutes writhing around on the floor breathing like a faulty vacuum cleaner. Think of the 2k as 4 x 500m, maintaining for the first three and then increasing stroke rate for the final 500m. If you are looking to peak for a certain rowing event then I’d recommend the Custom Plan to anyone. One word of caution is that if you do feel you are improving very quickly, either through fitness or technique, then the initial pacing might soon become too slow for an optimal training effect. Don’t be afraid to go a second or two faster, or to estimate a new 2000m time and work off those numbers instead. For a program to suit your general training The Pete Plan is a really popular choice. There are two sessions each week that change in a three week cycle, so once you’re onto week 4 you have identical sessions to compare and see if your fitness is improving. If this all seems like too much work then the British Rowing Intermediate plan is included in the spreadsheet I linked to earlier, which is two short rowing workouts per week alongside 10-15 minutes of additional cardio (running, cycling etc.). 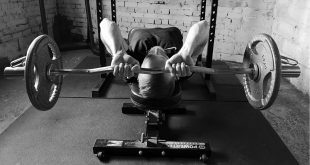 If your rowing technique needs a lot of work I’d keep the additional cardio the rowing machine and use it as an opportunity to refine your stroke. Finally the original Wolverine Plan, taken from a Women’s University Rowing Team, involves some longer workouts and would suit someone less constrained by time who perhaps prefers to do more at a slower pace.